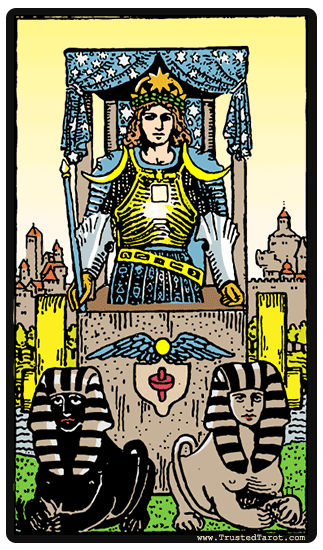 The Chariot tarot card depicts a figure sitting inside a vehicle that is being driven by two black and white sphinxes. The whole card has a bit of a celestial influence; the figure sits underneath a blue canopy adorned by white stars. On his shoulders, he carries the sign of the crescent moon, representing the spiritual influence under which he is guided. On his head sits a crown, meaning that he is enlightened, and that his will is pure. Emblazoned on his chest is a square, denoting the element of earth, of the material world, which grounds him and his actions. The sphinxes are colored in black and white, a symbol of opposing forces that the charioteer must learn to control. Here they are calm, but they frequently get into scuffles as they seem to want to move in different directions. His task is to guide these sphinxes towards a destination, one that is marked by the cosmic forces that he represents. The Chariot is linked to the Cancer zodiac sign. The Chariot tarot card is all about overcoming challenges and gaining victory through maintaining control of your surroundings. This perfect control and confidence allows the charioteer to emerge victorious in any situation. The use of strength and willpower are critical in ensuring that you overcome the obstacles that lie in your path. The Chariot's message comes to make you stronger as you strive to achieve your goals. The key message that he brings to you is that you must maintain focus, confidence, and determination through a process that will be full of winding turns and detours. If you have a plan or a project that you seem not to be sure about, the Chariot shows that you should pursue the plan with a structured and ordered approach. Your boldness will ensure that you achieve all that you should in this goal. The Chariot shows that you should pursue the plan with a structured and ordered approach. In the Chariot's quest for his goal, he may display some behavior that he has never seen within himself before - competition and a desire to succeed has perhaps brought out a more aggressive part of his personality. Aggression is a natural part of human nature, and the Chariot reminds you that it can also be used to help you take charge of your situation, but also must be reined in so that it does not hinder your way forward. The reversed Chariot's appearance in a reading can help you become aware of both your aggression, and your lack of willpower. It may either be saying that you are lacking in focus, motivation or direction, or that you are being warped by your obsession with your goals. In the former case, let the Chariot be a reminder that you can emerge victorious as long as you can gather the courage to do so. In the latter, your impulses may be another factor that you must rein in. To see the Chariot in reverse may suggest that you need to come to terms with the fact that you cannot always be in control. The Chariot reversal meaning can also be an indication of lack of control and direction over your life. You are at the mercy of the opposing forces and the obstacles, and cannot seem to muster the strength to take over. You are taking everything lying down, and life is dragging in any direction that it pleases. It should serve as a wakeup call and reminder that you will need to tighten some loose ends and take charge of your destiny.